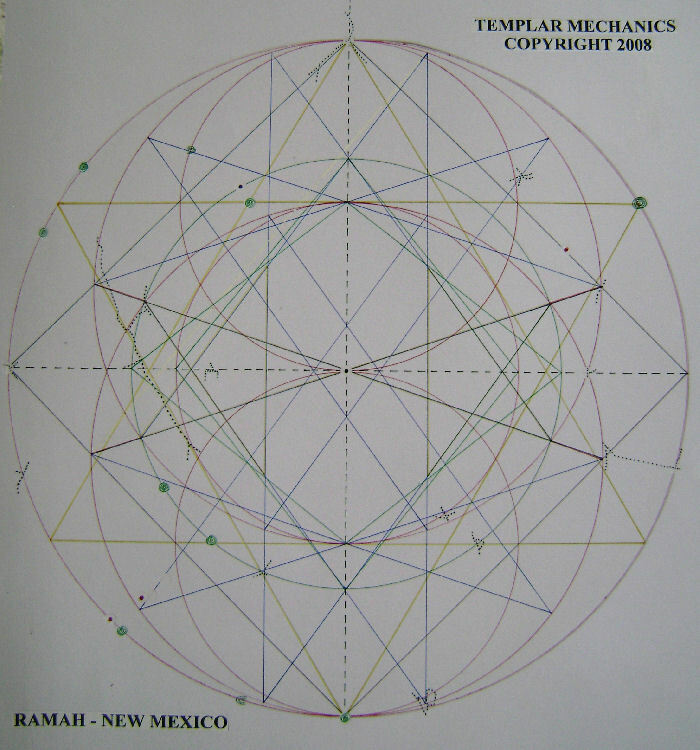 The Ramah New Mexico Grid was drawn for Karen Bishop who runs the ‘whatsuponplanetearth.’ web site….cut and paste link below. Karen has a great gift in that she picks up the changing energy patterns on our planet as it goes through the Ascension. Her interpretation of the changing energies and their effects often match what many of us are feeling as we go through our own personal Ascension. I had no doubt the Ramah area would throw up a unique grid. The grid encompasses many old Indian settlements and is part of the Zuni Indian reservation. 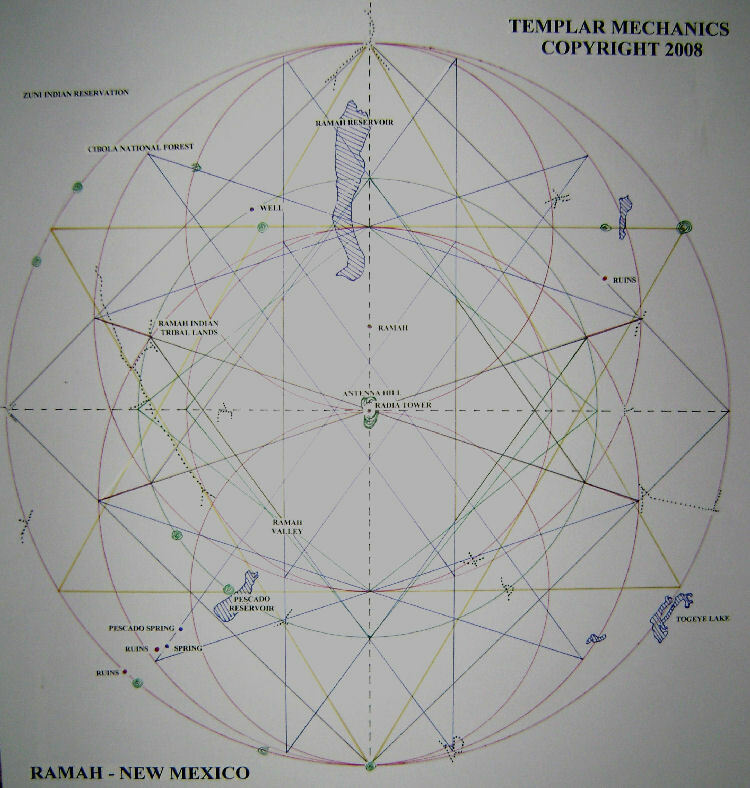 The grid is centred on a hill called Antenna Hill….and in particular a tower …Radia tower,…. good name for a centre. 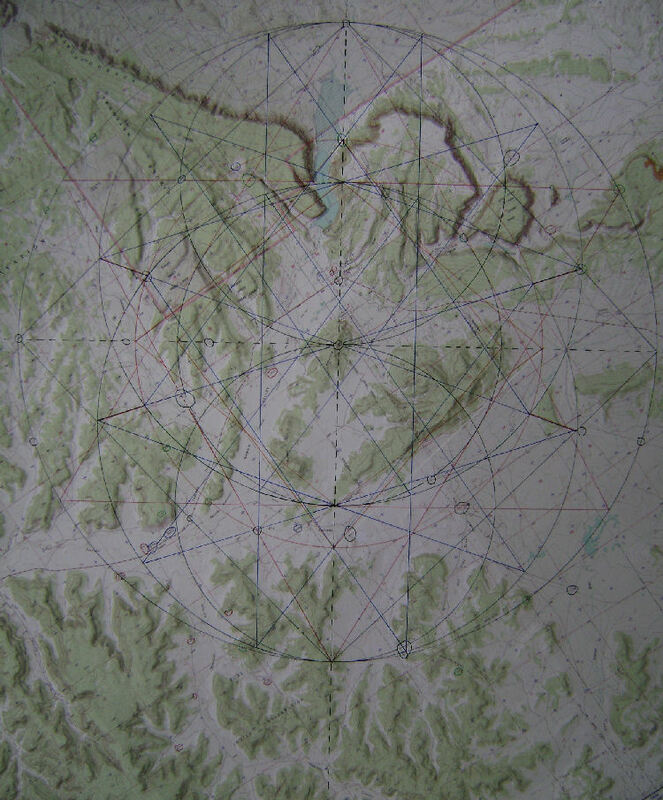 There is not the array of features like a European grid, However, what is on the ground correlates well with the geometry including merging of pathways, wells, springs, ridge lines, hills, high points, valleys, canyons and reservoirs. 20 regular pentas interlocked through a standard vesica centred on the large inner circles centres. Two smaller regular vesicas centered within, created by 3 - 5.15 circles…which give birth to the two large central rhombus leading to creation of twenty penta pole system. After drawing all the pentas it can be seen some lines double up for both penta systems..these lines have a black edge to them. 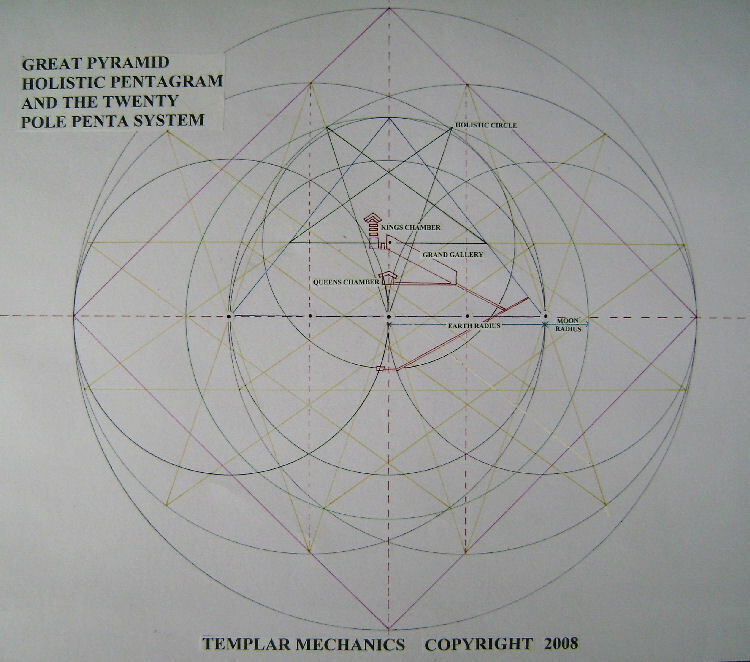 The LARGE SQUARE touching 4 points on the outer circle also confirm both the 20 pentas interlocking points- through denoting, on the larger inner circles, the rhombus top point leading to the pentas creation. I t also gives us the holistic circle radius - where it crosses the other larger circles circumference, along with the base leg points of a mini penta, as well as the alignment of the large rhombus and marks the point where the ‘double up’ penta line meets the circle. The last graphic below shows the Ramah grid turned through 9O degrees to illustrate the 20 penta pole systems relation to Gp dynamics. Note how the downward pointing penta created by the twenty pole sytem hits the GP at its centre on the base line…where we find Antenna Hill and with it Radia tower. Worth noting how the mini penta interacts with the Gp triangle in Green. The GP pyramid angle of 51.5 is unique in that if drawn from the main axis line of any circle will give you the moon radius as a proportion of the earth radius of the main circle drawn….. the earth being 3.66 x the moon radius…this holistic circle is marked in green like the Gp triangles. The radius of the inner smaller red circle is 3.66 x the distance between the red and green circle. …the gap between the two circles representing the moon radius in relation.
. Mini Penta arms touch the sides of GP, and also the penta legs touch holistic outer circle on the curve round at two points.